Gallo Pinto which consists of rice mixed with black beans, served with natilla (sour cream), eggs and fried plantain. 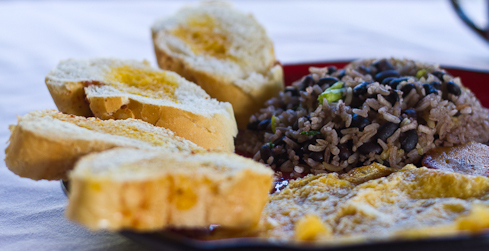 Miriam's Traditional Cuisine or "Comidas Típicas Miriam" known by the locals is one of the best spots on the San Gerardo de Dota area to enjoy traditional Costa Rican cuisine. Situated on a hillside overlooking the San Gerardo de Dota Valley, Comidas Típicas Miriam represents a combination of traditional Costa Rican Cuisine with the best that nature has to offer.